What's the point? That's the question director Jon Favreau and the brass at Disney had to answer if they were going to justify the money and man hours required to bring the visually stunning "live action" version of Rudyard Kipling's The Jungle Book to the big screen some fifty years after the Disney animated version taught generations upon generations of children the bare necessities of life. What would be the point of retelling this story to the current generation in an updated form? What more could they bring to it that children might not elicit from that 1967 original? In short, would there be more of a point to it than simply showing off the technical wizardry of Weta Digital and their visual effects work? The funny thing is, we more than likely remember the 1967 version through nostalgia-filled eyes that cloud our judgment of the actual film. In going back and watching that film-the one I very much enjoyed as a child despite being born in the late eighties-it quickly became apparent there wasn't much substance to the story and that the film was more a collection of little scenes filled with different, but interesting animal personalities that featured catchy songs written by the Sherman brothers and very little more until Shere Khan showed up at the end to create some type of tension. And so, going into this latest version of Kipling's story that would pull from both that source material while being heavily inspired by the '67 film the biggest improvement they could make would be in the story department by crafting a narrative that held a driving force with serious forward momentum and a throughline plot that, at the very least, would add a little more significance and reason to seeing the film in the first place. With screenwriter Justin Marks (whose only prior feature credits include a Street Fighter film and a TV movie) though, we are brought the one thing I couldn't even have imagined to add and that was a cohesion to the thinly connected events of the original animated movie. 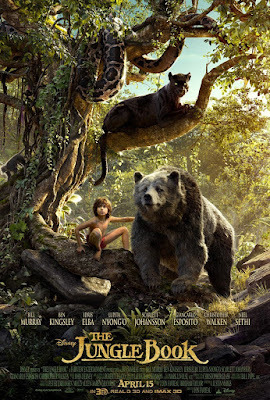 Giving purpose and connection that take Mowgli (Neel Sethi) from point A to point B lends the film a real ambition making the stunning visuals only more of an achievement. 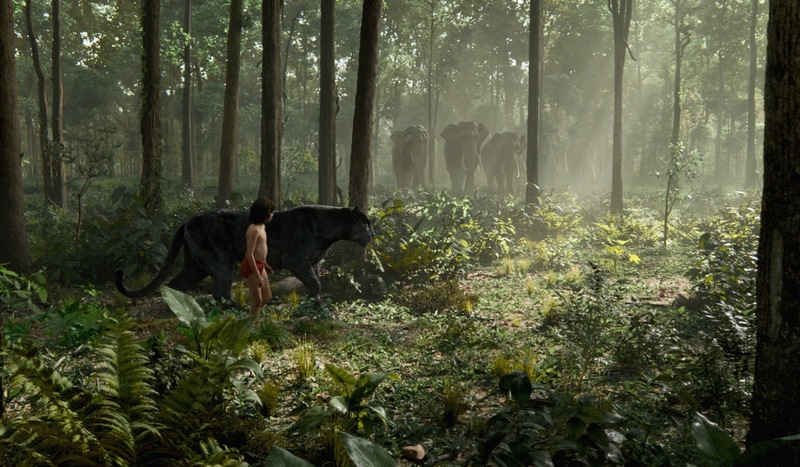 Mowgli (Neel Sethi) follows Bagheera (Ben Kingsley) through the jungle towards a new destination. Much like in the many iterations we've seen before we are privy to the plight of the man club Mowgli and his journey to try and fit in with his pack despite being distinctly different. The major details are still intact-the black leopard Bagheera (voiced by Ben Kingsley) finds a seemingly abandoned young boy in the jungle one day and saves him, but knows he needs to be raised by caring and capable parents. He takes young Mowgli to the wolves, specifically Akela (voice of Giancarlo Esposito) and Raksha (voice of Lupita Nyong'o), who agree to look after the boy and treat him as one of their own. As Bagheera states though, wolf cubs tend to grow much faster than man cubs and it becomes increasingly difficult for Mowgli to keep up the facade that he resides where he belongs. To add to this growing stress that time and change unavoidably bring is the fact the lush Indian jungle has not seen rainfall in some time. This causes the whole of the jungle animals to agree to an age old law around what is referred to as the peace rock that only becomes visible when the water has dropped to a certain point. It is at this last standing water hole that Mowgli comes face to face with Shere Khan (Idris Elba), the tiger who was attacked by man and has the scars to prove it and who is intent on ridding his jungle (or kingdom as he seems to view it) of any man or man cub that might eventually grow up to be another enemy. In executing this order Shere Khan threatens Akela to hand the boy over or witness the wrath of Khan first hand. In response, Begheera agrees with the wolf pack that the time has come to return Mowgli back to where he came and allow him to thrive in his natural environment. This presents its own set of complications though, as neither Mowgli nor Shere Khan want him to leave the jungle. Shere Khan wants him dead and Mowgli wants to remain in what is the only home he knows. It is on this journey back to the man village that Begheera and the boy are separated leading to Mowgli having to fend for himself and encountering new friends along the way that include the Indian rock python Kaa (voice of Scarlett Johansson), Baloo the bear (Voice of Bill Murray) and Orangutan Gigantopithecus King Louie (voice of Christopher Walken). While my personal feelings on Disney adapting many of their beloved animated hits into live action films is that of pure enthusiasm as it's all I wished for as a child in reality it all comes down to a case by case basis-some are more suited for the treatment than others. If they were to ever attempt such a feat with The Lion King I'd likely write mountains of hate mail as that honestly would seem pointless, but I'm certainly excited for that Beauty and the Beast adaptation. With The Jungle Book the main thing that gave me hesitation (besides the cast being largely made up of animals and running the risk of being more of another animated feature than a live action one) was the fact these life-like animals would need to talk and in a believable manner. Walking into Favreau's film I was concerned how long it might take me to buy into this idea that these animals could speak and that Mowgli, a human, had no issue in communicating with them. It is Kingsley's regal voice we hear come from the mouth of Bagheera first though, and from that opening scene it simply becomes an inherent part of the film-a factor easy to accept and one we buy into without issue. Part of me wants to believe that because Mowgli was discovered by Bagheera at such a young age that he wouldn't actually have been able to learn the English language or even develop the typical human tongue, but rather the film is simply translating the dialogue via voice actors because what we'd actually be watching without them would be a young boy cawing and howling at the animals around him and them doing the same in return. It would undoubtedly be the truth of the matter, but that would be over thinking what is more or less children's entertainment. Speaking to the fact this is a PG-rated film and intended largely for younger audiences and families (though given the aforementioned nostalgia factor it will appeal to everyone and is the real reason Disney wanted to tell this story again and sink so much money into it) there are a handful of scary to downright frightening moments throughout this version of The Jungle Book. While it does present a light tone and alternate reality to what a young man in the wilderness might actually encounter we are still dealing in a story that features a menacing tiger antagonist, stampedes, and towering monkeys whose agendas aren't always transparent. That said, the fear is necessary to drive the story forward and to push young Mowgli to be as resourceful and intuitive as he can be. This makes clear the advantage intelligence can have over brute strength and so no matter if it makes the young ones jump for a split second, there is a lesson to be taken away from the fear that is induced. Overcome it. 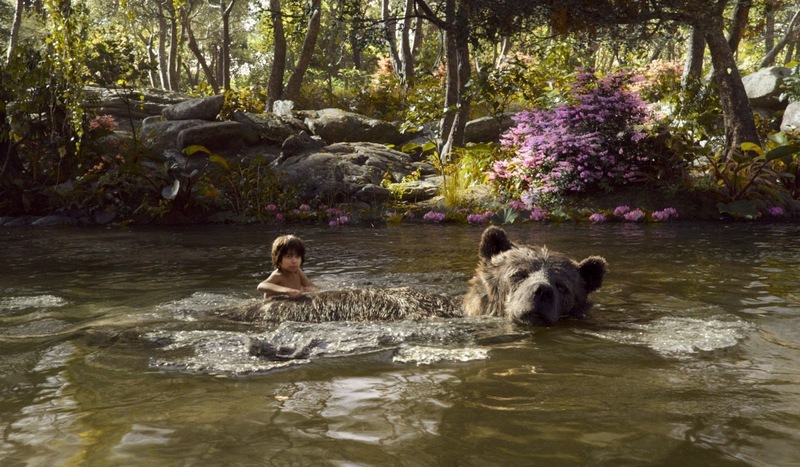 Mowgli and Baloo (Bill Murray) enjoy the "bare necessities of life" in Jon Favreau's The Jungle Book. Furthermore, the voice cast seems to be having a blast with the material, especially Murray. It becomes apparent from the first moment we meet his Baloo that this is very much a Murray incarnation-a version of the actor that would exist were he presented with the same circumstances as his character. He's funny, it feels more fresh than shticky, and most importantly the relationship between he and Mowgli is actually developed rather than the two assuming they'll be best buds based solely on the enjoyment of a musical number. And as Mowgli, Sethi is a wonder. It would be hard to imagine a seasoned actor doing as well with being the sole human presence on set, but in his screen debut Sethi comes off as wholly natural in a completely fabricated environment. The only things that seem to have been physically built were whatever Sethi touched or sat on and even then the entirety of most things were likely completed via visual effects. It is a mystery as to how some of the interaction between Mowgli and the animals were accomplished much less how they were able to draw actual emotion out of such scenes, but Favreau and his team have found a way to immerse us in this world and Sethi is a large part of why we're so willing and able to buy into such going-ons. King Louie and his song and dance number is undoubtedly the sequence I remember most from the original animated film and so it would obviously be the scene I had the most anxiety about here. While Christopher Walken has such a distinct voice he also manages to somehow always defy the expectations with his endearing sincerity that only he can make come through in his delivery no matter how many attempt an impersonation. As Louie, he makes the gargantuan Gigantopithecus both an enigma and myth whose mystery comes to be more satisfying than the actual character he is. The truth is that the entitled king isn't that interesting, but with Walken's interpretation and the crutch of such a famous musical number to prop him up his sequence comes to serve as one of the most stunning in a consistently stunning film. So yes, there is music in the film, but not an overabundance. Kaa's trademark "Trust in Me," is cut from the actual film and saved for the end credits (which are worth sticking around for too, I might add) while Baloo's famous theme song gets a quick montage treatment that features both Murray and Sethi exuberantly singing along with one another. Surprisingly, despite being somewhat sparse, these musical interludes don't feel out of place or wedged in for sake of their popularity, but rather feel inherent to the characters that incite them and pertinent to the stage of the story in which they're played. What is more exciting than the fact Favreau and Marks actually chose to include these songs though, is composer John Debney's re-working of their musical prowess. While the overall score finds itself more in line with most traditional orchestral scores for films of this nature, the swing style of the songs made popular by the sixties version that work themselves into more of a big band feel as the songs crescendo is genuinely inventive and rather spectacular background music for what are already enchanting visuals. Despite all of this-the remarkable visual prowess, the game voice cast doing solid work, and a script that cohesively brings together the disparate elements of the original animated version-there is still something missing. With the exception of a few quirks here and there this Jungle Book settles into a very straightforward, middle of the road adaptation that is indisputably enjoyable, but gives one no reason to love it. It is like buying a pizza from a chain restaurant and getting a free side of cinna sticks. It's dependable and consistent with the added treat of being truly stunning, but in the end it simply holds you over rather than leaving you fulfilled.